Kenny Jackett admitted Wycombe Wanderers deserved a late penalty against Pompey. Christian Burgess’ foul on Fred Onyedinma on 88 minutes led to referee Craig Hicks pointing to the spot, with Joe Jacobson sending the effort home to earn the Chairboys a 2-2 draw at Fratton Park on Saturday. 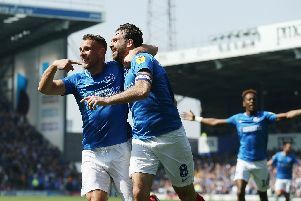 The goal cancelled out Brett Pitman’s header three minutes earlier after he thought he’d clinched Pompey all three points. Gareth Evans equalised for the Blues in the second half following Bryn Morris’ 21st-minute opener for the visitors. The draw meant Jackett’s side surrendered top spot in League One, with Peterborough moving to the summit after winning at Gillingham. And Pompey’s boss thought Burgess illegally brought down Onyedinma. He said: ‘People always ask me about the major talking points. ‘It was a penalty I felt. The referee will have his own views on his performance – that’s not something I’m particularly interested in. ‘To be fair, Fred is a strong lad. I signed him at Millwall as a 16-year-old and he is a strong lad. ‘Maybe we underestimated how strong he was but it is what it is. ‘Either way the referee has given it and the referee’s decision is final. ‘It was quite a long way from me to really get an assessment and speak to the player about it.